This has become the popular dish in my world as an easy option after a long day at work or when wanting something quick in all of these damn snow days. 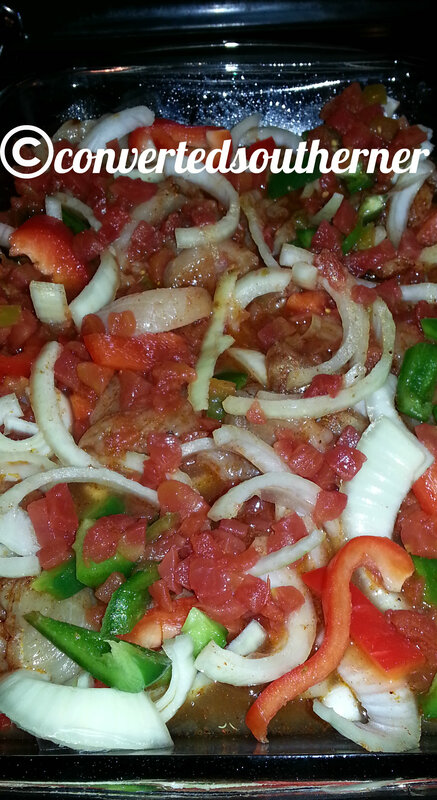 Baked Chicken Fajitas…. good fresh from the oven or as leftovers! Slice bell peppers and onion, removing seeds from peppers. Place in baking dish. Cut chicken into strips/ easy to eat pieces and place in baking dish. Add the two cans of Rotel tomatoes and chilies to the dish. Mix all spices in the vegetable oil in a measuring cup or bowl… after they are mixed spread evenly over all other items in the baking dish. I eat on warm tortillas with sour cream and cheese! This is also good for left overs as a part of a salad.